Can a human brain be digitized one day? Can humans become immortal by living forever as half robots? These are questions probably everyone are thinking about in the artificial intelligence sector. 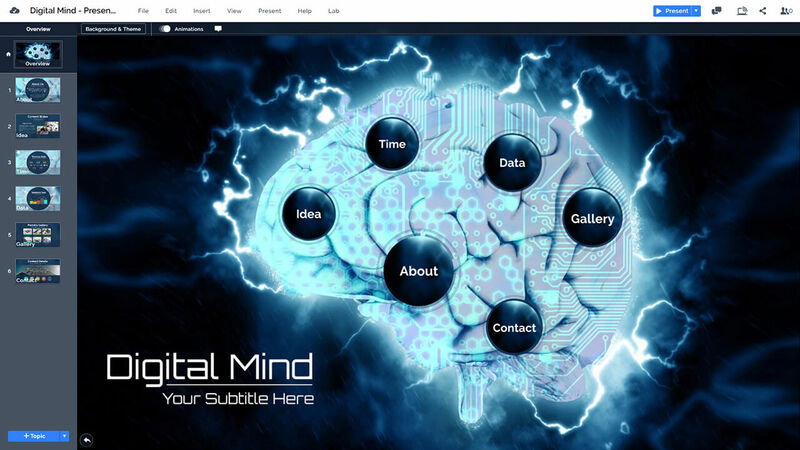 Prezi Next presentation template with a digital technology brain concept. An electric brain with microchip pattern on a blue background. A great template for talking about AI (artificial intelligence), deep learning, singularity and robotics. Will a robot be smarter than a human one day? Do your research and present it with this template! Artificial intelligence and robotics is the hot topic of the century. This presentation template perfectly illustrates the concept of thinking lightning fast. 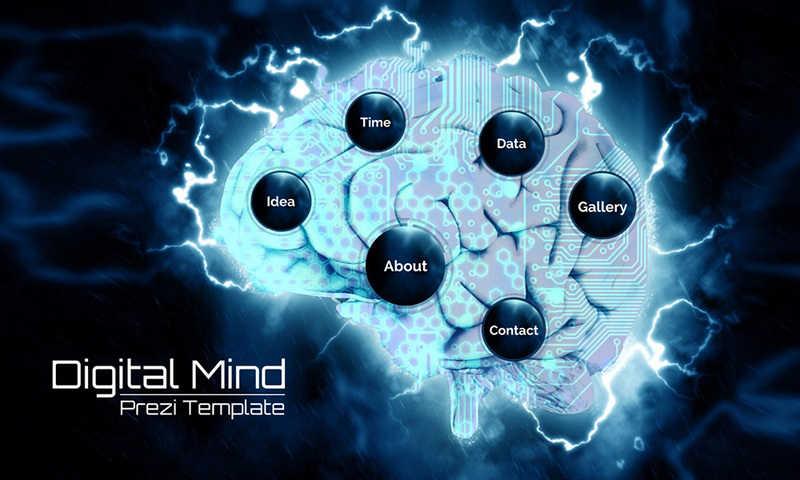 A blue technology themed template with a large brain image design in the middle, overlayed with a motherboard and computer chip elements and electric thunder around it. A great presentation template that showcases the fast development of this sector, mainly the deep mind and deep learning concept. Talk about the latest news in this technology sector or present about your related business. This entry was posted in Best Prezi presentation templates, Prezi Next Templates and tagged AI, ai presentation slides, ai presentation template, ai prezi template, ai techniques presentation, ai to presentation, android, application of ai presentation, artifical intelligence, brain, brain network, brain presentation template, deep learning, digital brain, digital brain concept, digital brain presentation, digital mind presentation template, history of ai presentation, humanoid, introduction to ai presentation, it, it brain, learning in ai presentation, machines, microchip, planning in ai presentation, presentation ai, presentation to ai, robotics, singularity, system, technology, what is ai presentation, wired brain.